Dr. Fabian M. Dayrit is recognized for his significant achievements in the field of chemistry, spectroscopy and environmental science which have contributed to the growth of science and science education in the country. He isolated and identified new pharmacologically active bioactive compounds in indigenous plants, particularly, lagundi. With students and co-workers, he explored the use of nuclear magnetic resonance for chemical analysis as well as structural analysis of polysaccharides, especially carrageenan from Philippine seaweeds. His researches established standards for essential composition and quality factors of commercial virgin coconut oil and how VCO can be differentiated from refined coconut and copra oil. 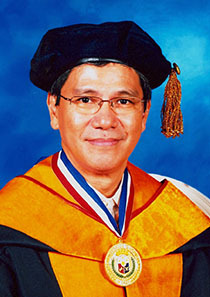 2002 - Achievement Award for the Chemical Sciences - National Research Council of the Philippines.